The Hotspur luxury apartment is on the second floor of the hotspur building. On the third floor is a belvedere (turret) where one can enjoy views over AInwick and the castle in the distance - an ideal getaway for a quiet game of cards, reading or to enjoy a glass of wine. Many of our guests enjoy having breakfast in the belvedere whilst watching the world go by below. The Hotspur apartment is quirky yet the interior is contemporary and is furnished to a high standard with light decor and carpets. 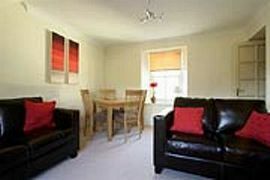 It is in close walking distance to shops, pubs, restaurants, the Playhouse theatre/cinema and Alnwick Castle and Garden. The lounge-dining room has leather sofas and dining table for 4. There is a TV with digital box for extra channels, DVD, CD-radio player, books and magazines for your enjoyment. 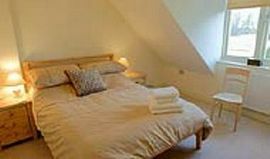 The front double bedroom has an en-suite shower room and heated towel radiator, TV.-DVD. Down a few steps at the rear is the twin bedroom. 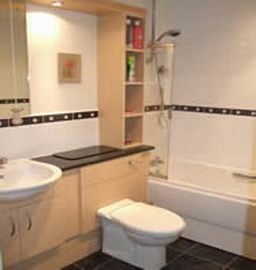 The bathroom has a bath with shower over and a heated towel radiator. 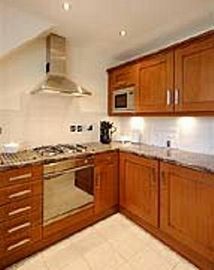 The modem luxury kitchen is well equipped, including dishwasher, washer-dryer, fridge, freezer and built in microwave, gas hob and electric oven. Iron and ironing board. 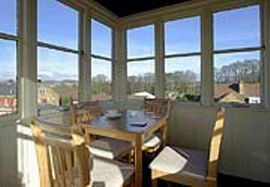 There is exclusive access to a third floor belvedere (turret) with table and chairs, where one can enjoy 360 degree views over AInwick. Located in the centre of Alnwick. Third floor belvedere (turret) with views over AInwick. Coming from the South, leave the A1 into Alnwick and follow the signs to the town centre. Look for Barter Books on your left and the apartment is about 100 yards further on, on the left, opposite Blackmores Restaurant-Hotel. Coming from the North, leave the A1 at the first Alnwick junction, turn right towards Alnwick on the B1340 and follow the road into Alnwick. At the Cenotaph turn right and the apartment is about 100 yards further on, on the left, opposite Blackmore�s Restaurant-Hotel.